Every Internet user have a social account. One, two, ten, twenty five… That depends from person’s social activity at the Internet. Any WordPress blog/site owner have special accounts on Twitter, Facebook, Youtube, etc. to promote there sites. Thus, having capability of easy showing your visitors your site social channels, enabling visitors to connect to their own social channels in one step with data from your site ready to send – it is a drastic enhancement to site usability, which leads finally to enlargement of traffic, quant of daily visitors, your content quotations at the Internet, that again increases traffic, etc., etc. There are plenty of different plugins with needed social networking functionality: 440 plugins contain word “social” at description, 334 plugins have word “share” at theirs description. How did I get such data? Visit ChoosePlugin.com – WordPress plugins search service with advanced filtering and ordering functionality, and check that yourselves. To the left you have icons, presenting your site social channels. To the right – icons with link to share current page with others. If user is not logged in to the selected social service yet, plugin will offer login window, and then redirect user to the new window to finish message sending. Here, to the right, just higher a little, “Social Toolbar” plugin shows the latest message from your Twitter account. Plugin authors realized the brilliant idea – you can play with large part of settings using live demo at their site. 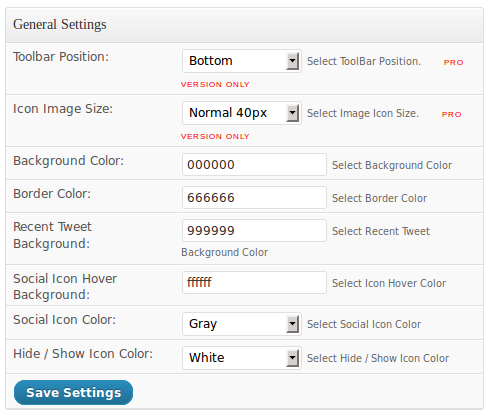 Click on the “Live Demo Settings” control at the left side of the screen and make your own social toolbar. and nothing else be happend. 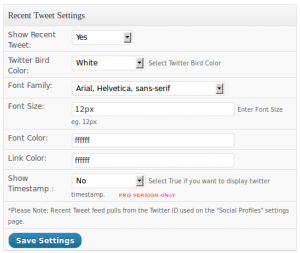 Pay attention, that you can input just your twitter user name, e.g. 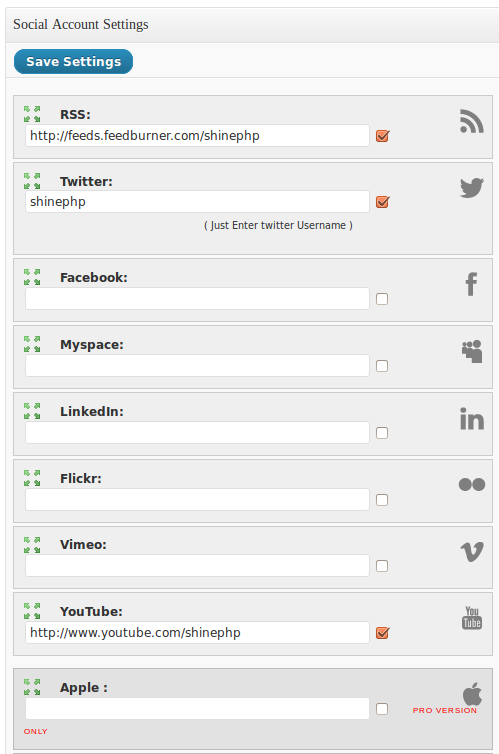 shinephp for mine http://twitter.com/shinephp Twitter channel. But do not try to make the same with Youtube or others – you should input full URL, like http://youtube.com/shinephp their. Plugin settings include the whole set, inspite of version you use. Settings, which doesn’t work at free version, just marked with red color note “Pro version only” and don’t work. Well, tell me effectively about differencies between free and Pro version at Pro version page. But why, should I spend my time looking on a huge not working staff (Pro version only) every time I open settings pages of free version? That’s not critical for plugin and site functionality in general. I see such messages because of my testing environment setup. But I wait that “Pro” product will be clean (from such behaviour, not bugs – as Web developer I know well how difficult to catch bugs:) ) and will not spam notices to server’s system logs at the high-loaded installations of the real world. Your settings from free version are not imported to the Pro version. Why? I did not delete free version. I just deactivated it. 10 social buttons are turned on by default and there is no any control to turn of all of them at once. So I shoul go and click on every service checkbox. Free version of plugin may position toolbar at the bottom of the page only. Top position advertised as additional feature for Pro version. But it is not useful at the current realisation, as it doesn’t take into account, that if you logged in to WordPress, then WordPress admin menu is already there, at the top row of the screen. 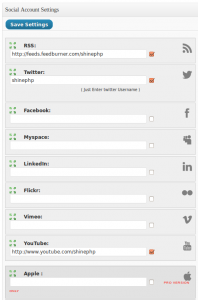 This way all social buttons of “Social Toolbar” are hidden under WordPress admin menu. So I should move social toolbar to the screen bottom again, as I had for free version. Additionally, I expect more position variants from Pro version, e.g. vertical positioning to the left or right screen edge. It is good, that you can simply drag and drop social channels at “Social profiles” settings page. I moved channels I use to the top for my conenience. It will be better do not see unused channels at all, while you do not directly add them from somewhere else. Inspite of some critics, which should be considered as suggestions for future enhancement, “Social Toolbar” is well-done and deserves his place at your blogs, dear readers. If you like modern, dynamic environment at your site – take a look, make tests and install it to your blogs. The latest free version available: 3.2. Quant of downloads: 94569. Download and start use it. This entry was posted on Sunday, July 29th, 2012 at 03:24	and is filed under WordPress. You can follow any responses to this entry through the RSS 2.0 feed. You can skip to the end and leave a response. Pinging is currently not allowed.